This is part three of my series on fast searching and filtering of text using C#. The previous article developed an indexing method using a hash table. This article develops a method using a trie structure. If you don’t know tries, I highly encourage to go read about them before continuing. This filtering method is much more complex than previous versions, but we’ll take it one step at a time. This diagram shows the top portion of an example trie structure. The root node has no results (since there are no values in the path to that node). 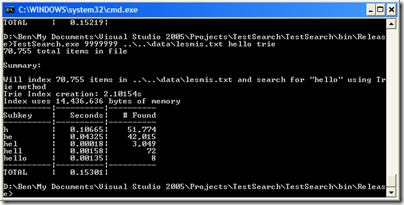 The _next variable indexes the next links in the chain. Here, there is only one link–to ‘h’. The node with the value “h” has two further links–to ‘e’ and ‘a’. So far, so good. However, in our implementation, we limit the depth of this tree to three so the results will potentially contain many entries. 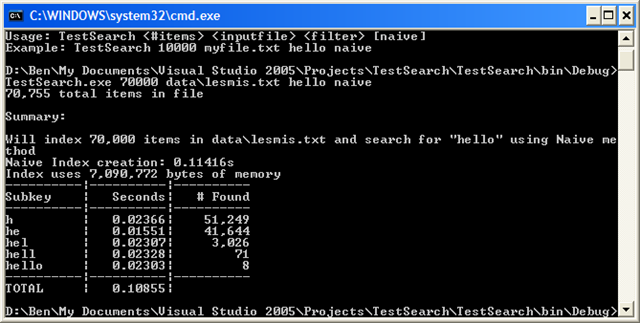 For example, if we followed the ‘l’ link in the “he” node, we would get to a node with the value “hel”. 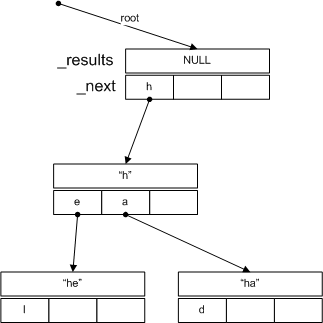 If we then indexed the word “hello”, the same node would then contain “hel” and “hello” because we’ve stopped the tree growth here. You can experiment with different values, but I found limited value beyond 3. To add a new item, we need to get substrings of the key, like usual, but unlike before, we don’t need to retrieve all substrings, just the longest substrings that aren’t the initial portions of a substring already found. Clear? Now, think about our trie structure. Is there any reason to consider ‘h’ if we’re going to consider ‘he’ anyway? Why not just store our value under the results for “he”, and then if we filter on ‘h’ , just return the unified results of the ‘h’ node and every subnode under it. We’ve just cut our memory requirements substantially. Once we have these substrings, we can generate the trie, inserting our value (and full key) into the results of the bottom-most trie node we can reach, creating new trie nodes as necessary. With that overview out of the way, let’s cover the basic data structures we’ll need to pull this off. This time, the sort order will be important as we’ll see below. 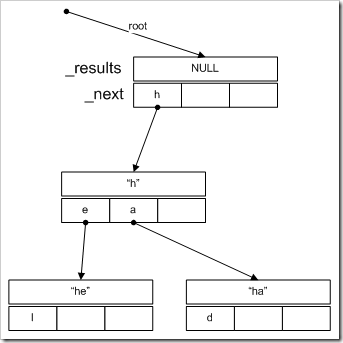 The next data structure we need is a trie. Technically, a trie is the whole tree, but since you can define a tree as a node with subtrees, it works to define a node too. The _val fields simply refers to the character this trie represents, though we don’t actually need it. I included it just for completeness. The _next dictionary associates the next character with another Trie object. 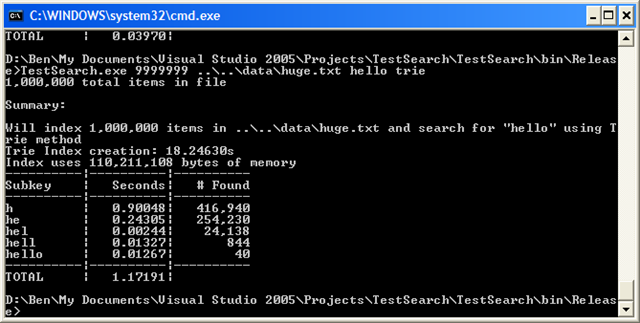 The _results list stores all items that need to be stored in the current Trie object. The properties just wrap the fields. Notice, that the node only adds results to itself–it doesn’t try to figure out if a result belongs in itself or a sub-node in _next. To do that would require that each node have knowledge about keys as well as its place in the entire tree. This logic is better kept at a higher level. OK, now we need to get into something more complex. We need a function to return all the results in the current trie, plus all the results in subnodes. Also, they should all be sorted. We could just return a huge list and sort them at the highest level with something like quicksort, but I have some additional knowledge about the data. I know that it’s being added in sorted order (since that’s how I define it. If it weren’t, we could presort each node anyway once indexing was done.) So let’s assume that each node’s results are already sorted. If that’s the case, we have an ideal setup for a merge sort! Now, it’s entirely possible that just doing quicksort at the end would be faster, but in my tests at least, the merging seemed a little faster, especially since the results were mostly sorted, which is quicksort’s worst-case scenario. This function interweaves the two arrays into a single array by always grabbing the smallest item from the next positions in the two lists. Look at lines 21-28. This is critical. We need to be on the lookout for identical sortorders, which indicate the same values. We don’t want to include those twice. This situation comes up when our value is “hi-ho” and we filter on “h”–results for both “hi” and “ho” will appear, and we don’t need both. We maintain the list of items to merge together with a queue. We first enqueue the items in this node, then we call GetCombinedResults() for all subnodes, and enqueue those results. Finally, we merge the queued lists together, enqueueing the result, until a single list is formed. Phew! OK, now let’s look at the rest of the indexer. As you can see, it’s mostly comments. Before we add our substring we make sure it’s the first occurence in the string of that particular sequence of characters (“don’t begin other substrings”). This prevents us from indexing “he” twice in the word “hehe”. We have our root trie node with a null character, and the constructor takes the maximum key length (which corresponds directly to the height of trie). Lines 3-10 are the typical preprocessing of the key, and creating a structure for it and the value to live. The fun stuff happens in 12-30. With each substring, we begin at the root, and try to branch out node-by-node, character-by-character to find the bottom-most trie in which to place our indexed value. If the next one doesn’t exist, we create it. Once we get to the bottom of the tree for this subkey we add our value to the structure. We set our current node to the root. We then figure out the length of the path we need to traverse. If our filter text is longer than our maximum key length, we only want to go as far as the key length (and vice versa). We do the same type of lookups as in AddItem, but this time if the next node isn’t present, we just return an empty list–there were no results for that filter text. 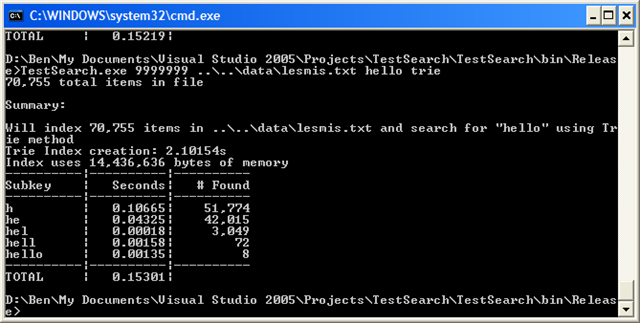 In line 5, we call GetCombinedResults() and store it in the variable preResults. Why preResults? Why aren’t they final? For one, they are the entire IndexStruct object, and we still need to extract the values. Secondly, it’s possible the user entered a longer filter text than we indexed, so we still have to do a linear walk of the list and do string searches to make sure the preResult is really valid. Thankfully, we can avoid this if the filterText is short. And now…we’re done! This one was a beast! There are still some optimizations to be found in here, but it’s pretty good. OK, so what about performance of this thing? OK, for raw speed it’s actually slower than naive–overall. But look closer. Nearly ALL the time penalty is coming from the lookup of “h”. The next results are over ten times faster than naive. Now, let’s compare to the substring method. The trie method is overall slower still, and the search times are comparable (except for the initial search). But, look at memory usage: the trie method uses less than HALF what the substring method used. Also, the index creation time is 4 times faster. Mixed bag, but impressive none-the-less. Ouch, over a second–but again, it’s all because of that initial search for “h”. All the other times are about the same. Comparing to the substring method, it uses almost a third of the memory, and takes a third of the time to create the index. So what can we say about this method? finding 0 results can be VERY fast (3-4 lookups in hash-tables to determine if a short filter text isn’t present). memory use is much better than enormous hash tables. Index creation time is better than other method. Searching for filter texts longer than a single character can be very fast. short filter text is bad–has to combine lots of trie nodes. So where do we go from here? I have some notes about implementing this paired with a ListView control. Stay tuned for part 4! 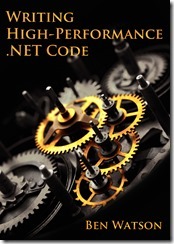 This entry was posted in Code and tagged .net, algorithms, Code, indexing, performance, programming, searching, trie on October 29, 2007 by Ben.